The following is a brief recap of the Tues., Oct. 2, 2018, BPS101 Regular Board Meeting. View the agenda and all supporting documents from this meeting and minutes from previous meetings. View BATV’s recordings of previous meetings. 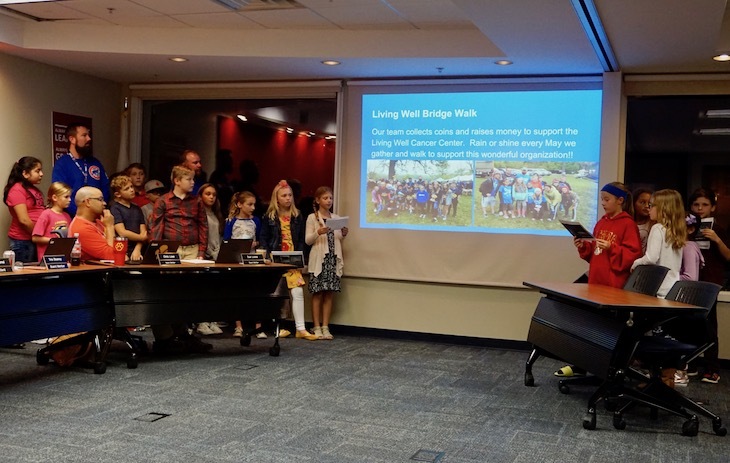 Fourth- and fifth-grade students in H.C. Storm’s Youth Leadership Team (YLT), along with their staff advisors, Matt Stanczak and Greg Bauman, shared several ways that the YLT supports H.C. Storm and the entire community through its numerous service projects. Take a look at the team’s presentation, which really highlights their work and how they are fulfilling their mission of service and giving back to the community. In November 2017, the Board of Education commissioned a Facilities Committee consisting of staff and community members. The committee has been meeting monthly and has made progress toward the goal of developing a long-term master facilities plan for 2021 and beyond. Members of the committee presented Part I of a two-part presentation to the Board of Education at the Oct. 2 Board Meeting. This presentation focused on the progress of the committee and the standards developed. Part II, including recommendations, will be presented at the Oct. 16 Board Meeting. Tues., Oct. 16, 7 p.m.
Tues., Nov. 13, 7 p.m.
Tues., Dec. 18, 7 p.m.